Belgian Malinois Dogs - The Belgian Malinois is a medium-sized dog from the sheepdog family and in the working dog group. The Belgian Malinois is a breed of dog, sometimes classified as a variety of the Belgian Shepherd Dog rather than as a separate breed. In the United States, the AKC recognizes it under the name Belgian Malinois. Like all Belgian Shepherds, the Malinois is a medium-sized, hard-working, square-proportioned dog in the sheepdog family. The Malinois is recognized by its short brown and yellow coat and black ears, cheeks, and muzzle. 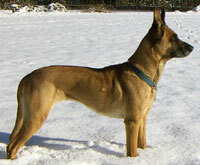 In the United States, Germany and other European countries, the Malinois is bred primarily as a working dog for protection, detection and police work. This information is licensed under the GNU Free Documentation License. It uses material from the Belgian Shepherd Dog (Malinois) article on Wikipedia.org. Belgian Malinois Breeders - Advertise your kennel puppies and dogs here.